The second Hội An International Food Festival will take place from 20-26th March 2017.Four days of events open to the public. Every evening, thế An Hội Sculpture Garden will be decorated and themed to the 12 countries of the participating chefs. The chefs will prepare traditional dishes from their respective countries. The event takes place at the An Hội Sculpture Garden ơn Nguyễn Phúc Chu every evening from 5pm. On the first day, prior to the public event, the chefs and participating restaurants will be welcomed to the stage at An Hoi Sculpture Garden. They will then be invited to experience a 'Taste the World Workshop' cooking demonstration by Ms Vy. Intended as a culinary and cultural exchange, Ms Vy will introduce Vietnamese culture and food - its history, ethos and medicinal benefits. Thomas Gugler - the Chief of Chefs will then introduce the team of invited chefs to the Media. The chefs will then create their signature dishes and have the opportunity to discuss the dishes with members of the media. 19:00 to 22:00: On the second day, the Chamber of Commerce will host a cocktail evening for the visiting chefs, sponsors, senior executives of the larger resorts in the region, and members of the press/media*. Limited tickets will be made available to the general public for this 'Taste the World' event ($100 usd / pax). Four days of events open to the public. 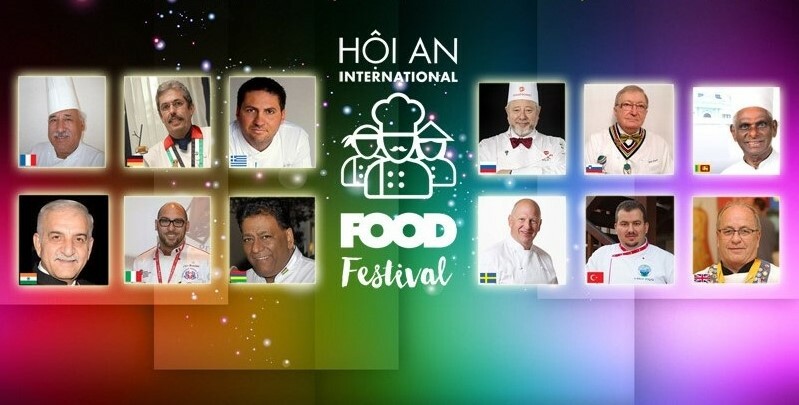 Every evening, the An Hoi Sculpture Garden will be decorated and themed to the 12 countries of the participating chefs. The chefs will prepare traditional dishes from their respective countries. The event opens to the public with an Opening Ceremony at An Hoi Sculpture Garden where guest chefs will be introduced to the culture of Hoi An. Participating restaurants will each occupy one stall and the respective guest chefs will create one hot and one cold dish. Ticket coupons (50.000vnd) will be available to purchase dishes at any of the stalls - 1 coupon can be exchanged for 2 dishes (one hot, 1 cold). The final day will consist the Closing Gala, with an awards ceremony for chefs and participating restaurants presented by the Hoi An People's Committee. This will be followed by an International Street Party with food and gift stalls in the area adjacent to Hoi An's iconic Japanese Bridge. Are you ready to Hoi An to participate The Hoi An International Food Festival The 2017?